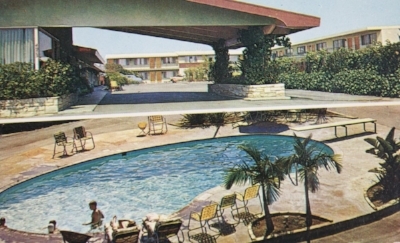 Don's Turf Motel is located in Los Alamitos, California and established in 1959. The motel has always been family run and maintained. However, the first motel opened by the family was called Don's Motel. It was located in Long Beach, California along Pacific Coast Highway. It included a gorgeous pool along with a restaurant that was also run by the family. As times changed and the family, they decided upon moving to a new location. Thus Don's Turf Motel came to be. Originally it was a one story, but was built to include a second story along with other additions over time. As the decades have passed, Don's Turf Motel has retained its vintage exterior while its interiors have been slowly updated. A motel that once ran on a corded switchboard phone system has changed to include a more modern feel at its own pace.